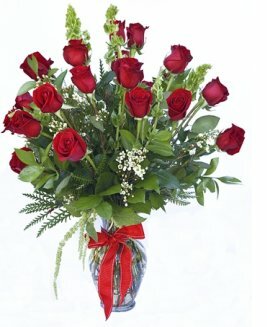 Order now for Valentine's Day! 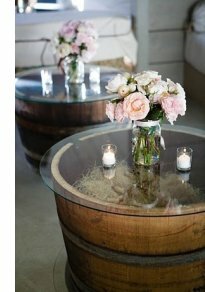 Floral Design Studio at 310-379-3634. 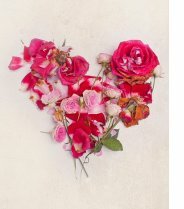 Bleeding hearts, the poetically named plants that are ANNUALS in our part of the world, have heart-shaped pendant pink or white flowers with spurs at the base and fern-like attractive foliage. 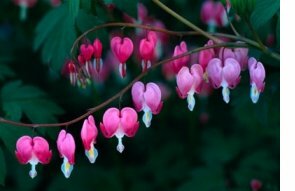 How to grow: Bleeding hearts need open or partial shade with an evenly moist, slightly acidic soil. Plant these graceful and romantic plants in containers by your front door and fertilize with Azalea fertilizer... for a lovely display during the Valentines Day season. 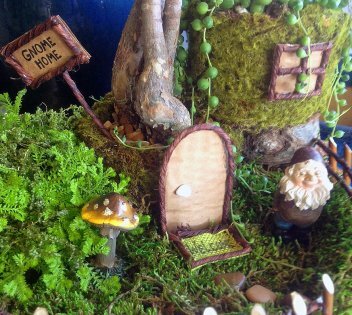 * Kit includes Italian clay dish, soil, two 4" indoor plants, sheet moss, reindeer moss, small decorative gravel, two small stones and a fairy or gnome. 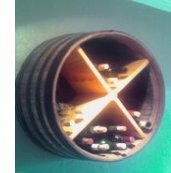 We will teach you how to build your own furniture as well! Ceanothus: California Lilac: Large group of native shrubs some low and spreading, some compact and bushy, and some reaching 10 – 12 ft. All have flowers in early spring with flower color ranging from white through pale powder-blue to very dark blue-violet. Extremely drought tolerant, needs fast draining soil. Good for maritime gardens. Ceanothus Popcorn (white) Ceanothus maritimus 'Popcorn' This low, mounding shrub has green leaves and clean white flower clusters. 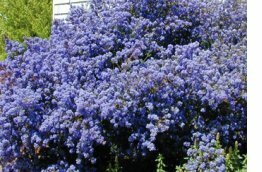 Ceanothus is a drought tolerant California native. Spreads quickly to form a beautiful ground cover. Ideal for the “White Garden”. grows 4'-6' tall. 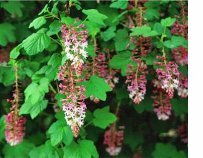 It has lobed, toothed foliage, pink flowers, and black berries between January and March. The Pink Flowering Currant is a California native, drought tolerant and attracts hummingbirds. Grevillea is a diverse group of about 360 species of evergreen flowering plants in the protea family Proteaceae native to Australia and perfectly adapted to our climate and soil. The species range from prostrate shrubs less than 20 inches tall to trees 115 ft tall. 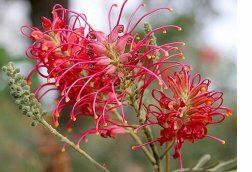 Common names include grevillea, spider flower, silky oak and toothbrush plant. The brightly colored, petal-less flowers appear in early winter and last for months. They attract hummingbirds. 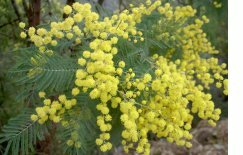 Acacia: There are many different types of Acacia, most are native to Australia but some are native to the Sonoran and Mojave deserts of North America. Acacias come in all forms, from groundcovers to trees, and consequently have incredible versatility in the landscape. Many have beautiful yellow puffy blooms in winter and early spring. 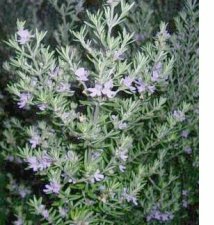 Fast growing upright dense growing shrub can reach 6-8 feet tall by 6 feet wide with slender smoky blue foliage and clusters of attractive light blue mauve flowers produced throughout the year. It is drought and seaside tolerant, and likes full sun to light shade. Useful as a large specimen shrub. Breath of Heaven. 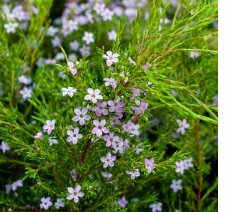 An evergreen South African shrub with pink flowers that blooms in the winter and early spring. It grows in sun or shade 4-6 feet high and 4-5 feet wide and likes regular water. Wax Flower. ( left) An evergreen shrub from Australia, the Wax flower blooms in winter through spring with pink and white flowers. It grows in full sun 2-3 feet high and 3-4 feet wide and needs only occasional water once established. 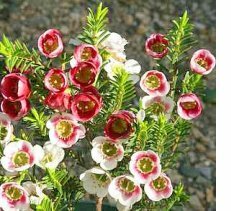 Correa Wyns Wonder : This evergreen shrub originally from Australia has variegated foliage and rose pink flowers that bloom winter through spring. It grows 2-3 feet high and 4-5 feet wide in sun or shade, is salt and wind tolerant and needs only occasional water once established. 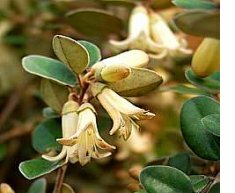 Correa Ivory Bells: Beautiful subtle colors in this loose, mounding, evergreen shrub from Australia. 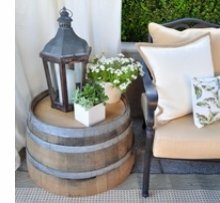 It has lovely creamy white ivory blooms that last from late fall through winter to early spring. Height: 4-5 feet, Width: 4-5 feet. It grows well in sun or shade and is wind and salt tolerant so excellent for seaside gardens. 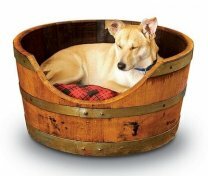 Needs only occasional water once established. 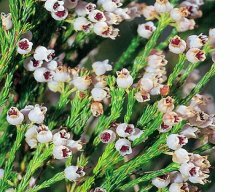 Erica (tiny white flowers) This evergreen South African native grows 4-6 ft tall and 3-5 ft wide. It likes full sun, moderate water, and has white flowers in the fall and winter. It's February and the earth is beginning to warm up. The daylight hours are getting longer. Spring might just be here already! Spring flowering shrubs are in full bloom all over town (see article left). In the garden Hardenbergia and Winter flowering Jasmine vines are in full bloom, the roses and clematis are beginning to leaf out, the bluebells and daffodils are pushing their green tips through the earth, and violets are blooming. Azaleas are sending out the first buds of the year from the branch tips so it’s time to feed with a high phosphorus fertilizer from now until they are finished blooming. February is a month for maintenance and preparation. There is pruning and fertilizing to be done. A lot of what you do this month will reap benefits when the warmer months arrive. Weeding is easy when the ground is soft. We’ve had some good rains in the past few weeks, so stay ahead of those weeds!!! If you don’t, you’ll be sorry! and debris from under roses and deciduous trees. This debris is a breeding ground for insect lava and fungal diseases and should not be left on the ground.Once you have cleaned it all up, spread a generous layer of mulch to feed the soil and prevent weeds. Working with nature by using organic is good for us and good for the plants. Incorporating earthworm castings into your soil is a great first step to going organic. Earthworm castings are a rich, all-natural source of organic matter with lots of nutrients and moisture-holding capabilities. Castings improve the soil structure and increase fertility making them the most enriching soil conditioner available. Feed your soil ... As plants wake up with the lengthening days they will all benefit from fertilizing. Feed the soil they grow in with with Fox Farms organic fertilizers or Gro-Power all purpose fertilizer and soil conditioner and the soil will feed your plants. This month you will see gardeners de-thatching lawns all over town in preparation for warm-season grass. (FYI – Early fall is de-thatching time for cool-season lawns). Thatch is the layer of matting between the soil below and the blades of grass above. A layer of thatch up to one half inch is okay, but thicker than that is not healthy for a lawn. To keep thatch down to a minimum, don’t mow more than one half of the length of the grass height at one time, and allow the clippings to lay where they fall. The clippings will decompose and will provide a good source of nitrogen to feed your lawn. Feed your lawns, and patch bare spaces with seed amendments, Topper or, if you are old school, Steer Manure. If you want to transplant or plant shrubs, perennials, grasses, fruit trees, citrus trees, herbs, or roses, February is the month to do it! Get these plants into the ground while the weather is still nice and cool. They will experience very little stress and have time to establish themselves before the heat of summer. 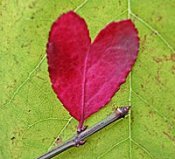 Deciduous plants and trees, roses, fruit trees and any other disease prone plants need spraying with dormant oil spray this month for fungal diseases before their flowers emerge. Peach trees must be sprayed for peach leaf curl, peach leaf blight and canker BEFORE the buds break. 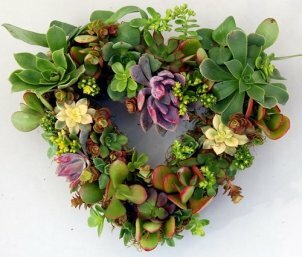 Many succulents and cacti bloom at this time of the year. February is a good time to repot them if they have out grown their pots – just make sure that they have finished blooming. Plant azaleas and camellias now while they are in bloom amending the soil with acid planter mix. 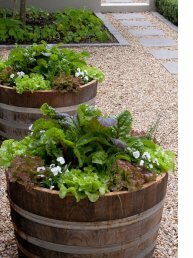 lettuces, broccoli, greens, sugar snaps, and cabbage, and you can also still plant cool season annuals such as pansies, cyclamen, primroses, sweet peas and snapdragons. JUST ARRIVED: leafy vegetables, strawberries and lettuces in 6-packs... tomato, artichoke plants in 4" pots. 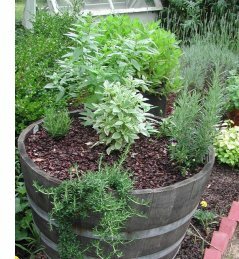 Get your herb garden started! We have a comprehensive range of new season herbs in 4" pots - all can be planted or potted up now. Time to start seeds for flowers and vegetables for transplanting in early spring. 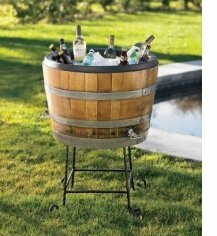 Seeds to sow outside – ageratums, alyssum, bachelor’s buttons, calendulas, candytuft, celosia, columbines, coreopsis, English daisies, delphiniums, dianthus, forget-me-nots, four-o-clocks, hollyhocks, larkspur, lunaria, pansies, California and Shirley poppies, salvias, snapdragons, stocks, sweet peas, sweet William, and native wildflowers. When annuals such as pansies start to get spindly, pinch back the weakened growth and promptly remove faded flowers. Then feed with a liquid foliage fertilizer. 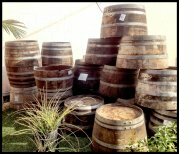 This will make the plants become full and lush again. Seed Planting Tip: Don’t plant seeds too deeply. Seeds planted too deeply will never reach the soil surface. One of the biggest mistakes made by a beginning gardener is planting too deeply. As a general rule, the soil that covers the seeds should be only three times their thickness. Small seeds, like carrot or lettuce seeds, need only a one-eighth-inch covering of soil at the most. If we get some rainfall make sure your irrigation is turned off, but keep an eye on your garden in case we have a hot or dry spell. This is a great time to do irrigation maintenance and repair. Avocado trees are ready for fertilizing if you are on the coast or any other frost free areas. If there is still a chance for frost where you live, wait a couple of months so you don’t lose new growth that spurts from your feeding. This is the month to fertilize your citrus trees. Remember some major holidays as a guide for when to fertilize your citrus: Valentine’s Day, Memorial Day and Labor Day. Nitrogen is the element that established citrus trees need the most and it is responsible for assuring a good fruit crop and a healthy tree. Water the tree the day before, spread the fertilizer over the root zone and water in well. The feeder roots of citrus trees are very close to the surface, so it’s important not to over fertilize, or you could burn your tree. picking at dusk or dawn, or treat with an organic slug bait such as Sluggo. 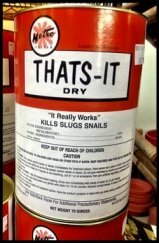 If you want to get serious about your slug and snail population "That's It!" is the way to go. Formulated for flower beds it is the strongest slug and snail bait on the market. NOT to be used near edibles. Keep the yard raked to clear leaf litter and other decaying debris to keep the snails, slugs and other pests from hiding out in your garden. Plumerias have dropped all their leaves with the cold weather. If you want to take cuttings of your plants, this is the time to do it, before the new leaves start to develop. Let the cuttings dry up at the cut end and wait for 2 months before planting. Pruning winter flowering vines and shrubs like Hardenbergia and some Ceanothus after they bloom gives them a nice clean look, and a head start on next year. If plants such as liriope and other blade-leaf plants look ragged and unsightly, you can shear them to the ground now before new growth appears and wait for their new leaves to take over. Cut your cannas and gingers down to the ground now. Time to give your fuchsias and begonias a hard pruning. Fuchsias bloom only on new wood and need to be cut back annually to produce new growth. 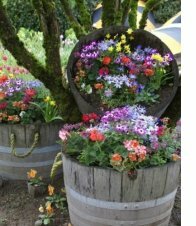 Cut back hanging basket plants to container’s edge or 4 inches above the soil. Cut back shrub fuchsias by half or more. Prune begonias to keep them from getting leggy. Cut cane and angel-wing begonias to pot level or three or four nodes from the ground. Prune wax begonias 1-2 inches from the ground. Buddleias, more commonly known as Butterfly Bushes, need to be hard pruned now. Most plants can’t handle the heavy pruning that these plants can. You can cut back 75% of the plant now and keep pinching the new growth to promote thicker growth over the next few months. bloom last season, it’s time to divide them. 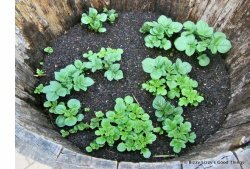 Dig up clumps, pull or cut them apart and replant the sections, or share them with your friends. 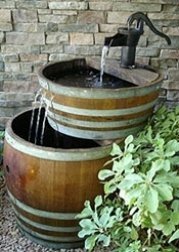 This is easier to do after a good rain or watering the day before. a little bit of fertilizer now that it’s starting to warm up. 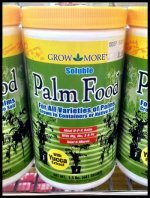 We recommend GrowMore Palm Food, which is great for indoor foliage plants. 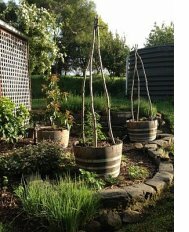 Check to see if your plants are root bound and need re-potting. If so re-pot them into a pot that is only slightly bigger than the one it is in now. Re-potting into a much larger pot might result in the soil volume retaining too much water and the plant may die from root rot. If your pot IS much larger, use Cactus mix instead of potting soil to ensure proper drainage.